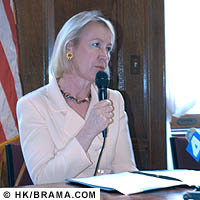 New York, NY (June 6, 2005)  Lufthansa and the Wheelchair Foundation (website) today announced they have teamed together with First Lady Libby Pataki to lead a delegation of volunteers to Kiev and distribute nearly 300 wheelchairs to needy recipients. Details of the trip, which includes the first-ever meeting between First Lady Libby Pataki and First Lady Kateryna Yuschenko of the Ukraine, were announced this morning at the Ukrainian Institute in Manhattan. "Lufthansa is proving to be a wonderful partner with the Wheelchair Foundation in bringing humanitarian relief to countries all over the world. I look forward to working with them as we continue to deliver wheelchairs and our message of hope and mobility," said First Lady Libby Pataki. In its ongoing efforts to bring hope, mobility and freedom to disabled persons around the world, the Wheelchair Foundation joined efforts with the Ukrainian-American community in New York last February and raised $42,000 for a total of 560 wheelchairs to be distributed in the Ukraine during the course of 2005. The action brought together more than 150 individuals and organizations from the Ukrainian-American community. The first container of 280 wheelchairs has already arrived in the Ukraine, and the community is anxiously awaiting the American delegation to begin the distribution. 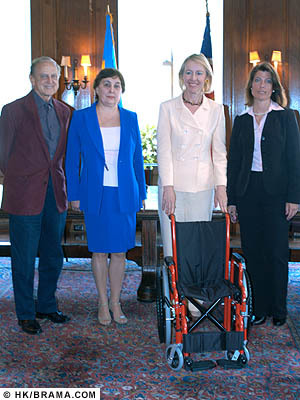 "The Wheelchair Foundation is proud to work with ethnic communities, the Ukrainian Institute of America, Self-Reliance NY Federal Credit Union, Lufthansa and others to build bridges of friendship through humanitarian assistance," said Wilson Kimball, Executive Director of the Wheelchair Foundation in New York. "It is wonderful to change lives for the better, one wheelchair at a time." The participants' journey from the U.S. to the Ukraine was supported by Lufthansa in its donation of free airline tickets. "Lufthansa is thrilled to support the Wheelchair Foundation and Ukrainian-American community in New York in making this trip a reality," said Lisa Markovic, Regional Sales Manager, Lufthansa, Northeastern U.S.A. "As an airline, there's no better way to connect people, hopes and dreams. We are extremely proud to participate." From its Frankfurt and Munich hubs, Lufthansa provides one of the most extensive global networks of any major airline, serving 355 cities in more than 90 countries worldwide, including 16 U.S. gateways. For reservations and further information visit www.lufthansa-usa.com, see your travel agent or call 1-800-645-3880.